One of the best things about winter is all of the cute animals that come with it! There are lots of winter animals to make crafts out of with your kids. You’ll love having these crafts on the back burner when you’re snowed in or it’s too cold to play outside. Check out these winter wonderland animal crafts! Get out the bag of cotton balls to craft this fuzzy winter penguin. Let your kids hang up their artwork on your fridge to admire all winter long! Imagine a winter wonderland by crafting these snowy owls out of foam cups! Easy as 1, 2, 3! 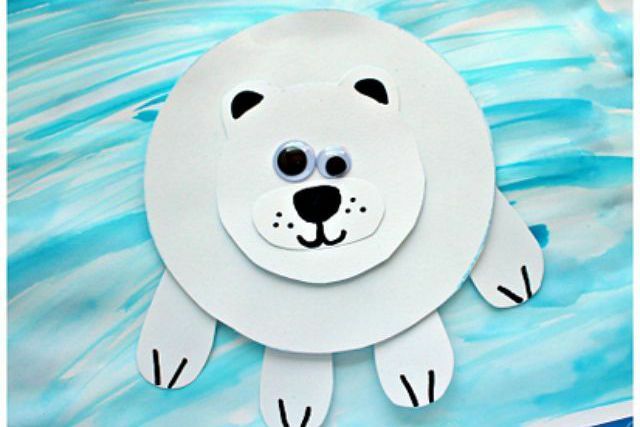 Use white paper, glue, and googly eyes to create these silly winter polar bears. Use watercolors to make the ice that he sits on. Shred sheets of paper and shape them into different winter animals. Polar bears, penguins, fox, and more! Recycle old Coke bottles to make black and white penguins. This is a great winter keepsake that can be played with year after year! Your kids will be super excited when you suggest this craft. Make your favorite winter scene and add your favorite winter animals. Your kids can put these snow globes by their beds to enjoy. Teach your littles about the big tusks on a walrus! They will be fascinated by it. This simple craft uses only a few supplies that you probably already have lying around your home. Whip up a yummy winter snack with your kids in the kitchen. These banana penguins are fun to make and fun to eat! I have heart eyes for this sweet paper raccoon. What a fun craft to do with your kids. Perfect for winter or Valentine’s Day! We love crafts that use brads. Teach your kids how to use them by making this paper plate winter bear.